James Abram Garfield (November 19, 1831 – September 19, 1881) was the 20th President of the United States (1881) and the second U.S. President to be assassinated (Abraham Lincoln was the first). His term was the second shortest in U.S. history, after William Henry Harrison's. Holding office from March to September of 1881, President Garfield was in office for a total of just six months and fifteen days. Garfield was born in Orange Township, now Moreland Hills, Ohio. His father died in 1833, when James Abram was 18 months old. He grew up cared for by his mother and an uncle. In Orange Township, Garfield attended school, a predecessor of the Orange City Schools. From 1851 to 1854, he attended the Western Reserve Eclectic Institute (later named Hiram College) in Hiram, Ohio. He then transferred to Williams College in Williamstown, Massachusetts, where he was a brother of Delta Upsilon. He graduated in 1856 as an outstanding student who enjoyed all subjects except chemistry. He then taught at the Eclectic Institute. He was an instructor in classical languages for the 1856-1857 academic year, and was made principal of the Institute from 1857 to 1860. On November 11, 1858, he married Lucretia Rudolph. They had seven children, five sons and two daughters: Eliza A. Garfield (1860-63); Harry A. Garfield (1863-1942); James R. Garfield (1865-1950); Mary Garfield (1867-1947); Irvin M. Garfield (1870-1951); Abram Garfield (1872-1958); and Edward Garfield (1874-76). One son, James Rudolph Garfield, followed him into politics and became Secretary of the Interior under President Theodore Roosevelt. With the start of the Civil War, Garfield enlisted in the Union Army, and was assigned to command the 42nd Ohio Volunteer Infantry. General Don Carlos Buell assigned Colonel Garfield the task of driving Confederate forces out of eastern Kentucky in November 1861, giving him the 18th Brigade for the campaign. In December, he departed Catlettsburg, Kentucky, with the 40th and 42nd Ohio and the 14th and 22nd Kentucky infantry regiments, as well as the 2nd (West) Virginia Cavalry and McLoughlin's Squadron of Cavalry. The march was uneventful until Union forces reached Paintsville, Kentucky, where Garfield's cavalry engaged the Confederate cavalry at Jenny's Creek on January 6, 1862. The Confederates, under Brig. Gen. Humphrey Marshall, withdrew to the forks of Middle Creek, two miles from Prestonsburg, Kentucky, on the road to Virginia. Garfield attacked on January 9. At the end of the day's fighting, the Confederates withdrew from the field, but Garfield did not pursue them. He ordered a withdrawal to Prestonsburg so he could resupply his men. His victory brought him early recognition and a promotion to the rank of brigadier general on January 11. Garfield served as a brigade commander under Buell at the Battle of Shiloh and under Thomas J. Wood in the subsequent Siege of Corinth. His health deteriorated and he was inactive until autumn, when he served on the commission investigating the conduct of Fitz John Porter. In the spring of 1863, Garfield returned to the field as Chief of Staff for William S. Rosecrans, commander of the Army of the Cumberland. In 1863, he re-entered politics, being elected to the United States House of Representatives for the 38th Congress. Garfield was promoted to major general after the Battle of Chickamauga, shortly after he had had been elected. He left the army and returned to Ohio to take his seat in Congress. He succeeded in gaining re-election every two years up through 1878. In the House during the Civil War and the following Reconstruction era, he was one of the most hawkish Republicans. In 1876, when James G. Blaine moved from the House to the United States Senate, Garfield became the Republican floor leader of the House. In 1876, Garfield was a Republican member of the Electoral Commission that awarded 22 hotly-contested electoral votes to Rutherford B. Hayes in his contest for the Presidency against Samuel J. Tilden. That year, he also purchased the property in Mentor that reporters later dubbed Lawnfield, and from which he would go on to conduct the first successful front porch campaign for the Presidency. The home is now maintained by the National Park Service as the James A. Garfield National Historic Site. In 1880, Garfield's life underwent tremendous change with the publication of the Morey letter, and the end of Democratic U.S. Senator Allen Granberry Thurman's term. The Ohio legislature, which had recently again come under Republican control, chose Garfield to fill Thurman's seat. However, at the Republican National Convention Garfield gained support for the party's Presidential nomination, and on the 36th ballot Garfield was nominated, with virtually all of Blaine's and John Sherman's delegates breaking ranks to vote for the dark horse nominee. Ironically, the U.S. Senate seat to which Garfield had been chosen ultimately went to Sherman, whose Presidential candidacy Garfield had gone to the convention to support. In the general election, Garfield defeated the Democratic candidate Winfield Scott Hancock, another distinguished former Union Army general, by 214 electoral votes to 155. (The popular vote was much closer; see U.S. presidential election, 1880.) President Garfield took office on March 4, 1881. President Garfield being supported in the arms of his wife just after he was shot, as depicted in an engraving from an 1881 newspaper. Garfield was shot by Charles Julius Guiteau on July 2, 1881, at 9:30 a.m., less than four months after taking office. The President had been walking through the Sixth Street Station of the Baltimore and Potomac Railroad (a predecessor of the Pennsylvania Railroad) in Washington, D.C., on his way to a college reunion, accompanied by Secretary of State James G. Blaine and his sons, James and Harry. As he was being arrested after the shooting, Guiteau excitedly said, "I am a Stalwart of the Stalwarts! I did it and I want to be arrested! Arthur is President now," which briefly led to unfounded suspicions that Arthur or his supporters had put Guiteau up to the crime. (The Stalwarts strongly opposed Garfield's Half-Breeds; like many Vice Presidents, Arthur was chosen for political advantage, to placate his faction, rather than for skills or loyalty to his running-mate. It was thus conceivable that he might have been involved in the assassination). Guiteau was upset because of the rejection of his repeated attempts to be appointed as the United States consul in Paris—a position for which he had absolutely no qualifications—and was mentally ill. Garfield's assassination was instrumental to the passage of the Pendleton Civil Service Reform Act on January 16, 1883. One bullet went through Garfield's shoulder and out his back, just missing an artery; the second bullet lodged in his chest and could not be found, although scientists today think that the bullet is near his lung. Alexander Graham Bell devised a metal detector in an attempt to find the bullet, but the metal bedframe Garfield was lying on made the instrument malfunction. Because metal bedframes were relatively rare, the cause of the instrument's deviation was unknown at the time. Garfield became increasingly ill over a period of several weeks due to infection, which caused his heart to weaken. He died of a massive heart attack or a ruptured splenic artery aneurysm, following blood poisoning and bronchial pneumonia, at 10:35 p.m. on Monday, September 19, 1881, in Elberon, New Jersey, exactly two months before his 50th birthday. The ailing President had been moved to Elberon, a seaside community, in the vain hope that the fresh air and quiet there might aid his recovery. Most historians and medical experts now believe that Garfield probably would have survived his wound had the doctors attending him been more capable. Several inserted their unsterilized fingers into the wound to probe for the bullet, and one doctor punctured Garfield's liver in doing so. Guiteau was found guilty of assassinating Garfield, despite his lawyers raising an insanity defense. He insisted that incompetent medical care had really killed the President; although historians generally agree that while this was a contributing factor, it was not a legal defense. Guiteau was sentenced to death, and was executed by hanging on June 30, 1882, in Washington, D.C.
Garfield Monument at Lake View Cemetery in Cleveland, Ohio. Garfield Monument in Washington, D.C.
Garfield was buried, with great and solemn ceremony, in a mausoleum in Lakeview Cemetery in Cleveland, Ohio. The monument is decorated with five terra cotta bas relief panels by sculptor Caspar Buberl, depicting various stages in Garfield's life. In 1887, the James A. Garfield Monument was dedicated in Washington, D.C.
Garfield was a member of the Delta Upsilon International Fraternity. As of 2006, Garfield is the only person who was elected President directly from the United States House of Representatives. As of 2006, Garfield is the only person in US history to be a Congressman, Senator-elect, and President-elect at the same time. Garfield was the first ambidextrous president. He could simultaneously write in Latin with one hand, and Ancient Greek with the other. The assassination is also mentioned in the Johnny Cash tune, "Mister Garfield (Has Been Shot Down)" according to the album sleeve written by J. Elliot, released in 1965 by Columbia Records, and re-recorded for the 1972 album "America - A 200 Year Salute in Story And Song", as well in the song "Charles Giteau" by Kelly Harrell & the Virginia String Band as included in the Anthology of American Folk Music. In the 1992 film Unforgiven, set in 1881, the character English Bob mocks his (American) fellow travelers for the murder of President Garfield, comparing the republican system of government unfavorably with the monarchical. "If you were to try to assassinate a king, sir, the, how shall I say it, the majesty of royalty would cause you to miss. But, a President, I mean, why not shoot a President?" Robert Lincoln, son of Abraham Lincoln, was a witness to Garfield's assassination. 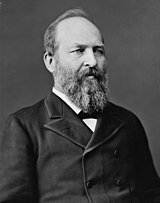 Ackerman, Kenneth D. Dark Horse: The Surprise Election and Political Murder of James A. Garfield, Avalon Publishing, 2004. ISBN 0-78-671396-8 (paperback) and ISBN 0-78-671151-5 (cloth). Teacher, Soldier, President. The life of J.A. Garfield, 1964. ^ Mr. Lincoln's Whitehouse: Robert Todd Lincoln, The Lincoln Institute, Retrieved November 29, 2006.